We continue to live in a time where people are hungry and where the land we traditionally use to produce healthy crops continues to diminish. We now live in a time that has more building space than garden space. We live in a time of new direction for the ways healthy, fresh, and tasty food arrives to your table. We live in a new time that circles the call of yesterday's and tomorrow's needs. We live in the time of GreenWheel Gardens. GreenWheel Gardens using state of the art LED technology in a commercial-scale, controlled environment farm can profitably (based on an average price of $3.50 per pound) produce between 600,000 to 750,000+ pounds of various produces in less than 40,000 square feet of warehouse space per year. By combing local grown, with the urban gardening movement we have created a method to grow, at commercial scale, produce within densely populated areas. Our system brings commercial scale crops into the heart of a city environment. Ten percent of the energy used annually in the United States was consumed by the food industry. As much as forty percent of energy used in the food system goes towards the production of artificial fertilizers and pesticides. Fertilizers and pesticides are some of the most insidious polluters and carcinogens known to mankind. 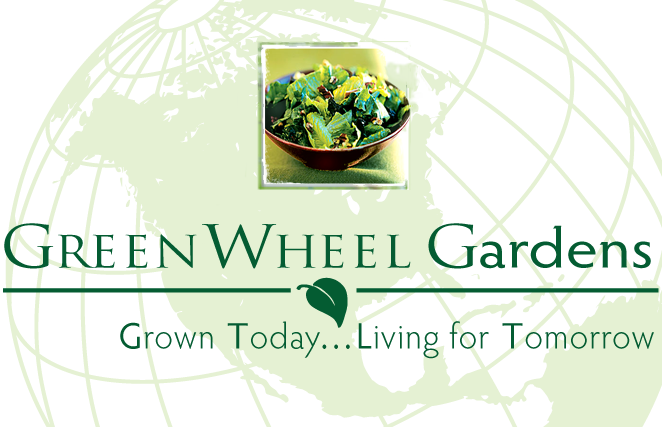 GreenWheel Gardens uses no chemicals or pesticides. The Centers for Disease Control and Prevention (CDC) estimates that 48 million food-borne illness cases occur in the United States every year. At least 128,000 Americans are hospitalized, and 3,000 die after eating contaminated food. Salmonella infection usually occurs when a person eats food contaminated with the feces of animals or humans carrying the bacteria. GreenWheel Gardens produce is grown under the strictest of standards in a tightly controlled environment. Approximately 90 percent of all the fresh vegetables consumed in the United States are grown in California's San Joaquin Valley. In 2005, more than $120 billion of agricultural products crossed U.S. borders as imports and exports. As a result, the average American foodstuff travels an estimated 1,500 miles before being consumed. GreenWheel Gardens utilizes unused warehouse space from 5,000 to 40,000 square feet all located around densely populated areas reducing transportation cost to nil. As the world continues to struggle with an ever growing population, food shortages, water shortages, energy constraints, and economic uncertainty we know that certain fundamental things need to change and others must be reinforced. We must be able to feed ourselves, and we must do so in a way that has the lowest negative impact on our environment around us. We must act now to shape our future for our children or suffer the consequences. GreenWheel Gardens has created a system that can make that building and warehouse space productive again. As a direct comparison of our efficiency, GreenWheel Gardens can grow between 600,000 to 750,000+ pounds of produce per year in just 40 thousand square feet of building or warehouse space, whereas, one acre of farm land can only produce 33 thousand heads of lettuce in sixty days. In a perfect world, a typical farm may produce 6 crops in a year that would be 198 thousand heads of lettuce. GreenWheel Gardens can reach production scale at a local level with a profit and without chemicals, pesticides, or genetically engineered seed and become highly profitable in just 3 years.